An early twentieth century postcard of the Ferry House. 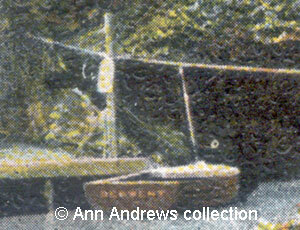 The picture provides a good view of Matlock Bath's "middle" ferry which had been operating for many years. The ferry itself was a smallish craft - the name "Derwent" is on the back of the boat next to the landing stage as it was the boat used for the ferry - and there was a guide rope about six to seven feet above the river for the operator to pull on. In earlier times this rope was made of hemp, which must be the case here as the rope is tied to a tree on the right hand river bank. It was later replaced by a wire rope. 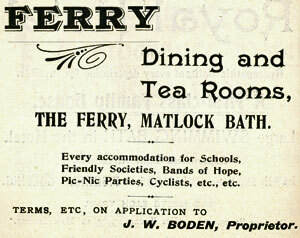 Mr John William ("Bill") Boden, who was one of Matlock Bath's best known caterers and later ran the Derwent Gardens Café", was a resident of the Ferry House which was situated at the rear of the Pavilion nearer to the boat landing which was demolished in 1910 or so to make way for the Pavilion". The card's sender was clearly enjoying themselves as the message on the back reads: "Staying overnight. Had a ripping time". that the ferry man pulled on. 1. 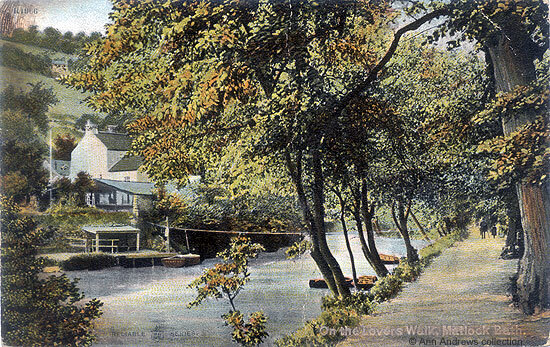 Postcard Reliable Series, No1966 Posted Manchester 9 June 1900 and sent to Mrs Lowe in Flixton. With thanks to the late Ken Smith. Mr. Boden was still living at Boston House, opposite Masson Mill, in the 1901 census with his wife, younger son and future daughter in law. John William Boden's name is first linked to the Ferry House in Kelly's 1899 Directory and later in Kelly's 1908 Directory. He moved to Edinburgh House. There was another J. W. Boden in Matlock Bath at the time who was the proprietor of a grocers and confectioners shop and also of Boden's Restaurant. Reminiscences of the late Mr. Frank Clay, from his private papers and notes owned by the webmistress. My late father was describing Matlock Bath shortly after the first war and this extract written about 1998.